Dont mistake me for a fashion snob who wouldn’t be seen dead in yoga pants. I am a huge fan of comfort and practicality: T shirts, Skorts, Leggings, Clogs, Fit Flops = LOVE! Gap.com works for me for the basics. It doesn’t matter where the day takes me, it boils down to a few simple questions. What’s on the days agenda? I try and dress for the weather, the activities and all things in between. How much thought will this require? When I have a head full of mummy stuff and very little room for anything else, getting dressed in the morning is the final straw. I invest in some good basics from a few brands that I like and that fit well. I stick to lightweight neutrals. Easy dressing is all about a pair of well fitting pants or a skirt that can be worn with heels or flats. A nicely tailored jacket and a few tops that can be mixed and matched and work well with jeans are a good investment . Don’t forget that summer is a great time for a pretty dress. Tunics with leggings are a mummy must. 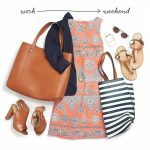 Boden.com is a great place to start . No one who has children under 18 should bother with anything the has the dreaded “dry clean only ” tag. There is nothing more irritating than having a favorite clothing item frizzle and fall apart after two washes. I try to invest in the best quality items I can afford. We all know that laying out the days clothes the night before is a joke, but I would like to think I can get things organized enough in the closet so my fav go tos are right there. A few minutes planning ahead has saved me a number of times during the morning crazies. A colorful scarf is great for hiding stains of any nature. Thanks to You Tube, there are some great tutorials on how to fashion them. An unusual pair of earrings or a statement necklace can up the game considerably. A foldable “oh so chic ” sun hat that can be a conversation piece is worth a try. I buy the best functional tote I can afford. I make sure it always has my necessaries in it. My boys call mine the ‘busy bag’. It’s summer, so don’t forget your sunnies! They work magic. No make up? No problem. I am a huge fan of the international jet set look , aka sunnies pushed back on the head ! Hello Jackie O ! Despite the daily chaos, the never ending demands, spending a few minutes on an ‘outfit’ is a little dollop of me time. I am learning that getting up, looking good and feeling better is not about a vavoom Jessica Rabbit re do. It is about how I feel on the inside and my place in the world that day. A happy mummy makes for a happy family and if all else fails, there’s lipstick !